The 30.61 metre motor yacht Skyler has been sold with Michael Mahan at Worth Avenue Yachts acting for the buyer and seller. Built in GRP by Italian yard Ferretti to a design by Zuccon International, she was delivered in 2012 as a Custom Line 100’ model. Accommodation is for 10 guests in five cabins consisting of a main deck master suite, VIP suite, double and two twins, all with en suite bathroom facilities. The main saloon has a comfortable lounge area with L-shaped settees to port and starboard and an entertainment centre including a large television screen. The standout feature of this area are two sliding doors to starboard giving access to a fold down sea balcony that offers a wonderful place to sit above the water with a coffee or cocktail and take in the views. Forward is a dining table with seating for up to 10 guests, and both the lounge and dining areas are carpeted and have ample storage space. 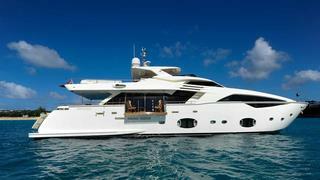 The aft deck has a built in aft settee, six chairs and a large dining table seating up to 10 guests. Intriguingly, the settee has a back cushion that rotates so that guests can either sit at the table or swing 180 degrees aft to watch the water activities taking place off the swim platform below. The bridge deck is set up with helm stations to port and starboard forward. Behind them is a large bar with two bar stools while further aft is a U-shaped settee seating eight guests, perfect for lounging or dining outdoors. Continuing aft, there is a six person Jacuzzi with sun pads. Twin 2,639hp MTU engines give her a cruising speed of 24 knots and a maximum speed of 27 knots. Lying in Fort Lauderdale, Florida, Skyler was asking $7.9 million.